Designed Specifically For Bays Where Service Speed Is Paramount, Shockwave Equipped Lifts Are The Fastest In The World! Shockwave Equipped Rotary Lifts come standard with the SPEED, CHOICE & RETURN on investment that will help you achieve your goals of greater technician productivity and higher profits. Designed specifically for bays where service speed is paramount, Shockwave Equipped lifts are the fastest in the world; helping you keep step with the ever changing demands in the vehicle service industry. 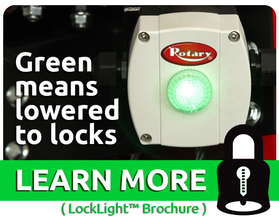 This innovative, industry changing technology is only available from Rotary, the world's most trusted lift. Capacity 10,000 lbs. 10,000 lbs. 10,000 lbs. Rise 81 1/4" 83 1/4" 79 7/8"
Overall Height 11' 8 1/2" 11' 8 1/2" 11' 8 1/2"
Required Ceiling Height 12' 4" 12' 4" 12' 4"
Overall Width 11' 5 1/2" 11' 5 1/2" 11' 5 1/2"
Drive-Thru Width 8' 6 1/2" 8' 6 1/2" 8' 6 1/2"
Front Arm Min/Max 31"-54" 27 1/2"-59" 27 1/2"-59"
Rear Arm Min/Max 31"-54" 27 1/2"-59" 27 1/2"-59"
Min. Adapter Height 4 3/4" 4 3/4" 3 5/8"
Time of Full Rise/Decent 25 secs./19 secs. 25 secs./19 secs. 25 secs./19 secs. Optional accessories/adapters available with various lift arm configurations. Please consult Rotary Dealer for details.